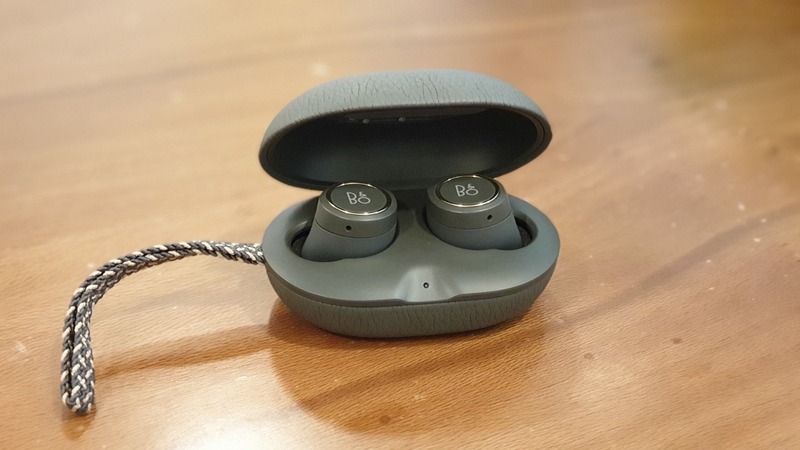 Bang & Olufsen Beoplay E8 Premium Truly Wireless Bluetooth Earphones let you enjoy sound quality and true cord-free convenience. The wireless in-ear design delivers hassle-free listening with no strings attached. These small wireless earphones are packed with the Bang & Olufsen Signature Sound and complemented by premium materials and a comfortable fit to create a next-level listening experience. The easy touch controls let you take calls, switch tracks or activate features and voice commands simply by tapping these in-ear wireless headphones. Upgrade to Beoplay E8 earbuds featuring Near Field Magnetic Induction (NFMI) technology for high quality audio streaming, Transparency mode to stay tuned in to your surroundings and enhanced Bluetooth 4.2 with DSP. Your earbuds will travel securely and elegantly in a leather charging case; after your initial charge of four hours this convenient case provides two additional 4 hours charges for on-the-go use. Batteries 1 LR44 batteries required. The E8 are truly wireless earphones. I loved the build quality and ease of use. While watching videos or movies on the phone, there is a slight lag in the audio, but it is not a deal breaker. The lag happens only in some apps, not all. The bass is a bit lower compared to my previous Jaybird Freedom wireless earphones. But, overall sound quality is very superior. The best part is that after I have started using the E8, I totally forget that I have them plugged in the ears. They are so comfortable and fit very well. The charging box is well designed and very small to be carried easily. The battery life is also great. I haven't had any battery low incidents till now, in my full day's earphone usage for workout music, daily walks, late night movie streaming. I put them for charging at night, though they would still be at 50% battery after the entire day's use. It is expensive, but worth every penny.